I delayed my review of Green Lantern Corps #20 for two weeks, since this issue was meant to be an epilogue to this week's Green Lantern #20. I wanted to read that issue before I commented upon this one, which is to be Peter Tomasi's last. Surprisingly, given the fanfare over Johns' departure, there has been no similar outcry for Tomasi's leaving this series. To my mind, this is a shame since Tomasi had an important role in developing the Green Lantern books over the last few years as well. If Geoff Johns can be called the architect behind the revival of Green Lantern over the last decade, I think Peter Tomasi should be considered the engineer. Johns made the plans but Tomasi frequently put the pieces together and made things work. Sadly, Tomasi's conclusion is a mixed-bag of sorts. 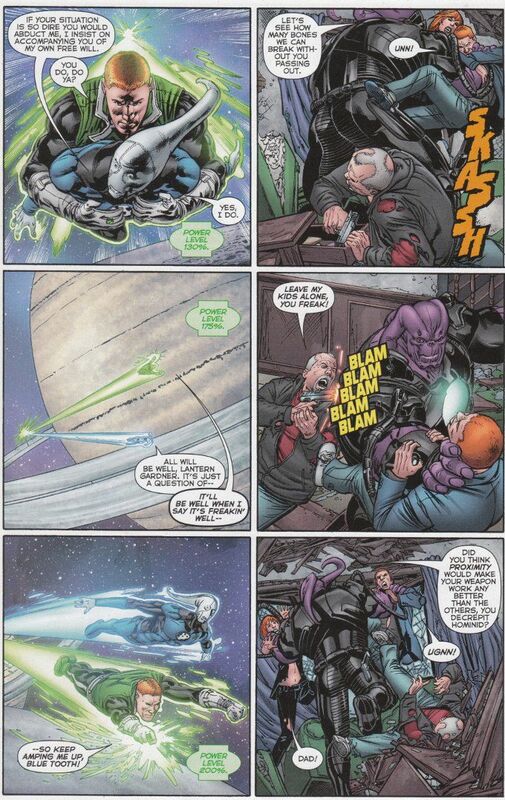 Most of the non-Earthling Green Lanterns this series focused upon are absent, with drill sergeant Kilowog and major domo Salaak showing up just long enough to confirm that they're alive. Even John Stewart - forced into an afterthought of a storyline trying to revive Mogo for most of the last year - is treated like a footnote, as he and long-time enemy Fatality have a sudden whirlwind romance that comes out of nowhere. Thankfully, the majority of the issue - focused upon Guy Gardner's efforts to save his family from an alien killer with a grudge - is more enjoyable. I'll miss the artwork of Scott Hanna and Fernando Pasarin on this title as much as I'll miss Tomasi's writing. I've long been of the opinion that Pasarin is one of the most underrated artists working at DC Comics today and this issue showcases Parasin's unique talent for drawing constructs as well as unique-looking aliens. Hanna's inks perfectly walk the line between definition and shading, looking picture perfect in every panel.